media presentation available at this stage. A closing discussion with participants on the project gave feedback to those results. In general, the participants liked the project idea and materials and were positive to have the report available to see activities in other countries. Contributions to the websites/ platform are expected in the near future. This document contains a summary on the ME2 event on the following pages. *to find possible further conclusions on support of the SETTLE project. could not bring further conclusions to it other than they were not using e-Learning for in their teaching. 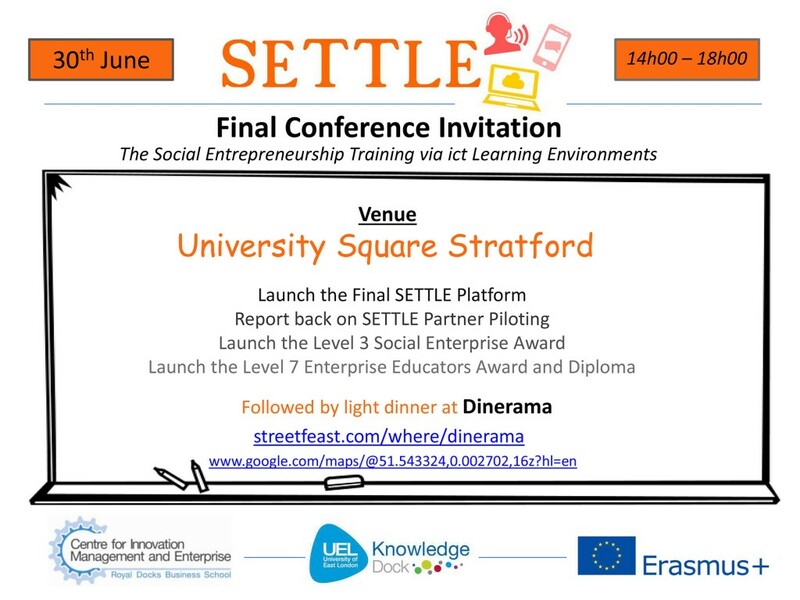 They particularly mentioned their interest in finding material in the future on the SETTLE virtual platform (O3). Based on the output also the process on social entrepreneurship in Austria was discussed and the necessity for a social entrepreneurship curriculum at different levels, possibly starting with the very young ones who would also be very used to eLearning from school. For future generations, recommendations on VR contents were recommended, as well as a game-based approach. Only one participant was aware of initiatives presented. During Q&A sessions, the participants were asked to also consider strengths, advantages and potentials on promoting the social entrepreneurship, how the perceived the project, as well as which challenges they saw. Related to the length of the documents presented, the majority of participants were hesitant if a condensed version would be more appealing and inviting to readers – as they would rather not read all of it. Suggestions came not to present the report as PDF document but as online text with hyperlinks that could be read without following all chapters. Also future testing involvement was appreciated to have limitation in time available (needed); self-guided learning was suggested to be considered more, particularly for higher levels and entrepreneurs. Suggestions on online presence was not further commented. The comments on the other dissemination material available were very positive as they found all very appealing. Project and results presented were estimated in general to be of high interest; recommendations given related to the production of interesting contents for a variety of curricula implementation needed in Austria in most education levels labelled ‘social entrepreneurship. Modern approaches – e.g. game based learning, inclusion of Virtual Reality – were recommended to attract young learners now, seen as necessity for any fee-based training (and future learners more experienced then in online learning). No further input to training was collated, few known. They were in general interested in receiving further details, partly in future involvement during the project.